Casa Can Parra is fully comfortable and in tune with the vibe of this special island, but its best trait is undoubtedly the location; from the villa a wild stretch of pine forest leads to the rugged beautiful coastline fringed by the blue mediterranean sea. This imposing view is situated approximately 200 metres from the villa and is the perfect spot to take in the panoramic views while soaking in the tranquility of the surrounding environment. The design and layout of the villa is based on the traditional rural dwellings of the Balearics. All of the fixtures are originals, acquired in different parts of Europe, and attentively restored. Casa Can Parra also hosts many distinguishing features such as the ceiling beams, which are old telephone poles, the floors are polished cement or wood, the sinks of the kitchen and bathrooms are marble and all of the furniture is select vintage with numerous works of art adorning the walls. These unique features bring a wonderful authenticity and welcoming feel to the house. Casa Can Parra has 6 spacious bedrooms, each with ensuite bathrooms and private outdoor terraces. The main house consists of master bedroom with bathroom, double bedroom with bath, a suite on two levels with double bed + 1 single bed & bath, another suite on two levels with double bed & bath, and a twin single bedroom with bath. The separate guesthouse can accomodate 2 guests and has a double bedroom with bath. Out front, the patio hosts a dining table for up to 14 guests, overlooking the garden which has many flowers and cacti. Just off this area is the spacious marble kitchen equipped with all the modern appliances including ice-maker, dishwasher, coffee machine and microwave. Two French doors connect the kitchen to the dining room and living area with a central fireplace dating to the 18th century. The living area has satellite / Cable television, DVD Player, and stereo with iPod connection. Two more glass doors lead to the covered veranda, also shaded, and decorated with antique furnishings and sofas. This home is located in Can Parra, a rural and agricultural region of the island of Formentera. The villa sits on a generous plot of 15’000 sq m with the house itself camouflaged by a row of low pines, further ensuring its privacy and serene environment. Thyme and rosemary enclose the wooden walkway, and around the square swimming pool which can be found in a further field off to the side of the villa. The pool is made of natural materials which reflect a green tone, blending it nicely into its Mediterranean surroundings. The sea is just 200 metres away. This villa is located in the countryside within Cap Barbaria and a short distance away from The lighthouse at the very end of the Island. The nearest beach is Cala Saona which is a 10 minutes away by scooter or car and the nearest supermarket is only 5 minutes away. 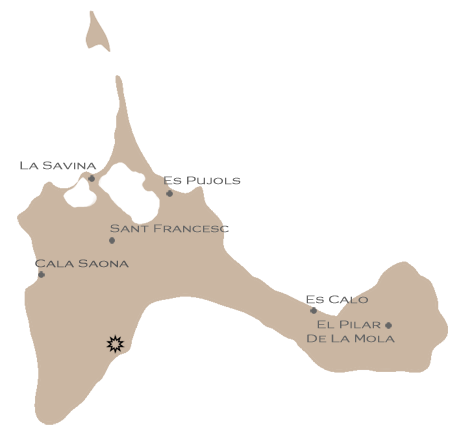 For all restaurants and amenities the closest town is San Francesc at 3km. The closest supermarket is located next to Bar Es Cap at the turn off to Cala Saona on the main road.